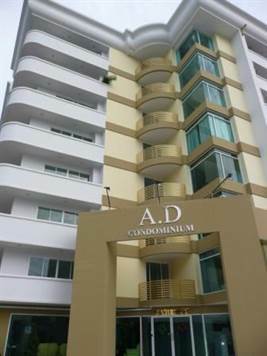 Bedrooms: n/a "Studios & 1 bedrooms"
A. D. Condominium is on Naklua Road Soi 16/1 close to the Baht taxi route and close to Wong Amat Beach. Facilities include reception, swimming pool, under-cover parking, 24 hour security, electronic key-card access, a shop and a laundry. It is close to restaurants. There is a school on Soi 16 by the Naklua Road. All our units have a sea view. Most units have a good sea view. Rooms 701 and 802 have an excellent sea view. The distance to Central Pattaya Road is 3.6 Km or 2.2 miles. A fully equipped fitted kitchen with granite working surface and good quality wooden cupboards. A 13,000 BTU air-conditioning unit in each room. Dark- stained or medium-stained wooden furniture matching the kitchen. A built-in shower unit with sliding door, a 6 KW hot water heater, large shower head, and shower stand. A ceiling fan with 5 lights in each room. 1.2 hotplates in the studios, a Siemens oven and 4 hotplates in the one-bedroom condos. 2.Kitchen hood and extractor with air-vent. 3.A Siemens washing machine in the one-bedroom units. 4.A vacuum cleaner in the one-bedroom units. 5.A 7.4 cubic feet fridge. 7.A 32 inch LCD TV. Additionally, a 32 inch Plasma TV in the lounge of the one-bedroom condos. 8.A Samsung home theatre in the one-bedroom units and some of the studios. 9.A DVD player with each TV. 10.Kitchen appliances: water heater, rice cooker, juicer, and toaster. 11.A coffee machine in the one-bedroom units and some of the studios. 12.A CAT Telecom fibre optic broadband Internet connection. There is a satellite dish for UBC TV on the roof. All units are in foreign ownership. Maintenance is 10 Baht per square meter per month.